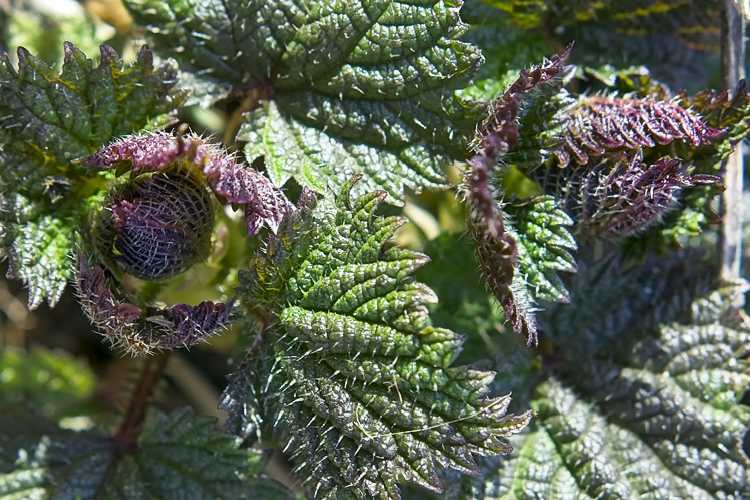 ← Permaculture: What is it? How do you do it? And how do you save the world? We buried our mother's ashes beneath the rosemary. Lambchop, Argus, Griffin, Molly, and Lupine are near her side. We planted my mother with the dogs in the pet cemetery. It’s true. She would have wanted it that way, right next to her best friend, little Lambchop. It’s not as bad as it sounds. The cemetery, which we affectionately call “Boot Hill,” sits on a little knoll with a view of the Olympic Mountains, overlooking a small creek and the neighbor’s barn and farmland. The sunsets there can be quite spectacular. My mother was a retired nurse. Intelligent. Caring. Even in the midst of a disease that steals your memories and leaves you without a sense of who you are, she never stopped giving and reaching out to others. Our family pets had a special place in her heart, as did the wild birds, which she helped through many cold winters. She loved the outdoors, the ocean, going fishing, and gardening – things she taught me to appreciate at a very young age. And so, when she passed from this earthly existence, rather than toss her ashes to the wind, to an outgoing tide, or down a river in time, we thought she might like best to be in our backyard, close to family and pets. 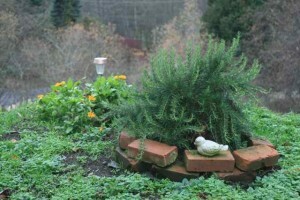 It was a stormy day in early December when my brother and I and other family members returned her ashes to the good earth and planted a rosemary shrub on top. At that precise moment, the clouds parted and beams of sunlight streamed through to that little spot below where we all huddled together in a circle, marveling at how such a strong personality could be physically reduced to such a small quantity of dust. We shared a few loving thoughts and memories and were thankful that she was finally freed. I played “Amazing Grace” and “Over the Rainbow” on my harmonicas, the clouds moved back in, and we left. 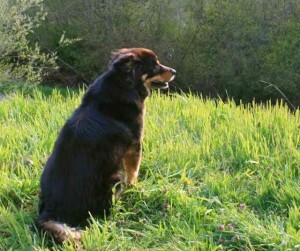 Barkley on the knoll, getting in touch with his inner dog, contemplating the world and all its wonders, or quite possibly, just enjoying a ray of sunshine. I often return. Sometimes I talk to our mother, ask her advice, talk about the goings on of this world; plus, it’s a nice place to play my harmonicas. Other times I just sit quietly and look out at the fields and mountains. Our dog, Barkley, frequently joins me. He is a rather tormented, somewhat neurotic soul, who has come a long way since his troubled days in the dog pound – hence the name Barkley, which is the kind of name you get when you spend time in the joint making a racket. I like to think that he sits there in a ray of sunshine in peaceful meditation, getting in touch with his inner dog, thinking about how he can be the best that he can be. He is a very intelligent, thoughtful creature. The rosemary shrub did not make it through the heavy rains and snow of this last winter, so early this spring, in memory of our mother, I decided to transform the area into a kind of mini-wildlife reserve – and also a kind of secret garden – a place to escape the craziness of this world. I started thinking of my garden in an entirely different light – not only a place to grow food to nourish our bodies, but also a place to nourish our souls. Plus, we needed a good windbreak to absorb the frequent storms we get off the coast, also something to help stabilize a steep slope, the aforementioned wildlife food and habitat, and last but not least, we needed to ensure that whatever we planted wouldn’t eventually block our mountain view. It was a bit of a challenge. First, we took advantage of a Conservation District native plant sale and planted about 20 firs and cedars and a dozen or so huckleberry plants. Not all of them made it, but enough will eventually grow to make a forest grove on the northern edge of the property. We will fill in the spaces with rhododendrons and native plants as time allows. To the west, we planted a new vine maple (Acer circinatum), a familiar Northwest wind-tolerant species that can grow tall in the sun or almost vine-like in the shade. It grows well with conifers, Doug Fir, hemlock, and dogwood. We planted it near the base of a gigantic maple whose limbs are starting to dry and break during winter storms. I love this old tree, and I am not sure why it is dying. Our house is over 100 years old, so the tree could very well be much beyond that. When my son was young, we built a tree fort in it and used to have picnics up there and read the original version of “Treasure Island.” You could hear us calling loudly from the branches, “Shiver me timbers!” The birds also love this tree, and we have often found cherry pits in our hideaway left by marauding raccoons. Between the vine maple and the cemetery, we planted a Black Hawthorn tree (Crataegus douglasii – Lindl. ), which will branch out and provide food and cover for birds and small mammals of all kinds. The hawthorn is a good fit for this spot because it will have room to grow; can be pruned to a hedge or thicket and makes a good windbreak; will stabilize slopes; can be coppiced; its branches can be made into tool handles; and all in all, it makes a good understory plant. Plus, they attract hummingbirds, which were my mother’s favorites. Around the gravesite, I planted Sunchokes – sometimes called Jerusalem Artichokes – a perennial sunflower that will multiply year after year, creating yet another windbreak. The starchy tubers are low on the glycemic index and provide a good substitute for potatoes, or so they say. Planting a variety of sunflowers here is kind of an inside joke between my mother and me because they unexpectedly showed up in her garden one year, and she was certain that I planted them there, which I swear to God, I did not. I explained a little bird must have put them there, but she gave me the stare that only mothers can give and said she could read “L-I-E” across my eyes, which in earlier years would have made me tremble with guilt. I have planted sunflowers in my garden every year since, and yes, Mom, I planted these out there for you and your little bird friends. 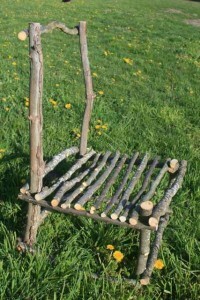 Homemade chair from apple tree prunings. The crowning achievement in this little retreat, however, is the living chair. 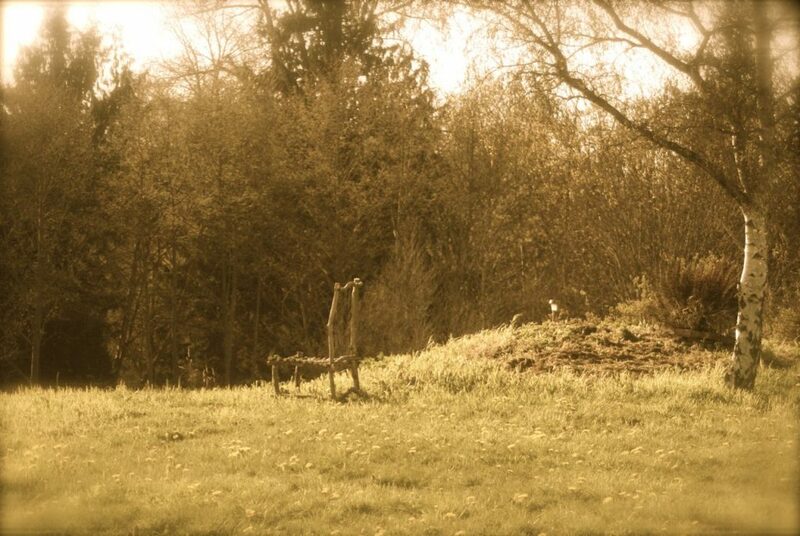 Barkley helped me pick the spot for this chair on one of his meditative days when I saw him out on the edge of the bank, his nose turned to the wind, his eyes closed with his face toward the sun, savoring the warmth of an early spring day. I had earlier saved the largest prunings from our old gnarly apple trees. I sawed them into pieces that would make two short legs in front, two tall ones in the back, braces to connect them together, and the straightest pieces for the seat. It is rather rustic looking, to say the least, but in it’s own way, perfect. I set it out in Barkley’s spot, on the south side of the little cemetery, beneath what I think is some kind of delicate birch, planted long ago (possibly by a bird). At the foot of each leg, I planted a willow cutting, a combination of Harrisons, Golden, and Noire de Villaine. They will one day grow tall and willowy (of course), and I will bend them into shapes, fitting for a throne. I shared a picture of the chair with a friend, who commented that he envisioned a woman sitting on it with a figure behind, arm extended, one hand on the shoulder of the seated figure. It seemed to represent departure, “but certainly not a sad one,” he noted. This vision is exactly what I feel there. The figure is my mother with her hand on my shoulder. No departure. She is always with me out there. I confessed to my friend that I have been going through some troubling times, which my mother understands – and in that is where the sorrow lies – but, like most earthly things, is transitory. We watch the sun go down together, along with our cadre of wild birds and pets. What I did not tell him, though, was that I was expecting a visit soon from my brother, who would be flying an airplane from New York, across the U.S., and eventually to Alaska, where his home is. My mother and I have always worried about him; he had had a difficult life in general, but had been going through some particularly hard times of late. Then one sunny afternoon, in what now seems an eternity ago, my brother buzzed our back acre with his plane. It was a vintage Cessna 195 aircraft, and he was like an ecstatic kid with the ultimate new toy. We later walked out to Boot Hill and I showed him how I was transforming our mother’s gravesite into a sanctuary of sorts for people, dogs, and birds. He liked it. We took turns trying out the chair. We talked about replacing the rusty looking dried rosemary. What I didn’t know at the time was that his plane had fallen off the radar. Before long, a search and rescue effort was launched, but the information had to travel to Anchorage and back before I heard the news. But in my heart, I already knew. I have just returned from Anchorage to bury my brother. Odd how you find things out about those you love after they die that you really always knew. He was more like our mother than I ever gave him credit for. His wife and young children have a long, difficult road ahead. I am sorry to report, there is no happy ending to this at this time. The garden has exploded in my absence. I walked out to our chair yesterday and cut away the wild parsley and other weeds. It felt good to chop and drop, slash, clean, mulch – do something strenuous. The sun came out in the afternoon, and I sat down to rest, feeling the warmth on my face. It occurs to me that in the blink of an eye, our lives are changed, yet all around me, life keeps on growing as if nothing happened. 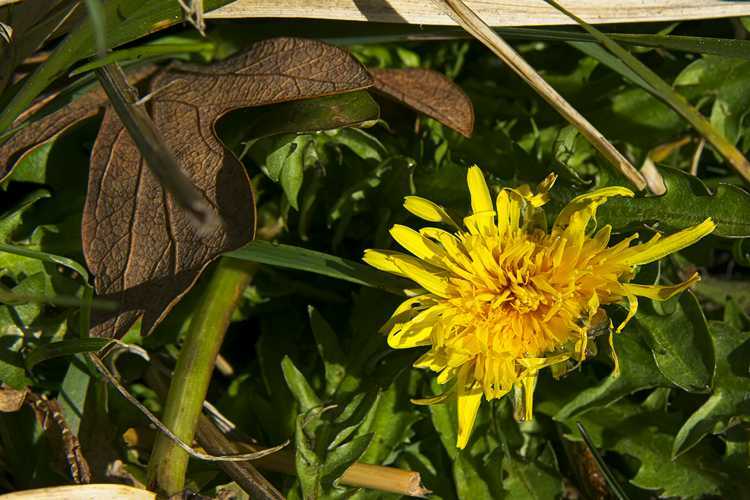 The days are long; spring rains are plentiful; the weeds compete for their share of the sun, just as they always have. I selectively choose those I allow to grow and bloom – such as the sunflowers – and cut back those that will turn back into soil and nourish their roots. It is something I can do in the midst of things I can do nothing about. I look down to see the willows sprouting at the legs of my chair. They will grow tall and bend, yet remain strong. With care, the chair will live on, long after I do not. I like this spot – this place where I can escape all the world’s craziness. Our most devoted of friends sit at my feet, and standing beside and slightly behind me, I can feel my brother, reunited with our mother. Their hands rest gently on my shoulders. I finally had time to explore barbolian.com and came across this story. What a wonderful idea for a Memorial Garden. Love that chair and Boot hill. I’m sorry what you went through on your brother’s death but what a loving tribute to both him and your Mom. You cotinue to inspire me. Hey, thanks, Carol. I still can’t read it without breaking into tears. Still very hard to even believe. Hope your dad is doing better. Was wonderful to see you – and good to hear from you again. I am so grateful you have the courage to share this incredible story of life and love with strangers. I was looking for a place to buy garlic for planting as we do each year. A friend told me of you last year but I never followed up. Somehow this year, this morning, I stuck with the process of internet searching until I found you. And was led to this page. I have to tell you I just hung a show at the Blue Whole Gallery (in the front window) of my paintings. All Sunflowers. I feel now that some of it, the energy in those works which have consumed me this summer, are for you, your mother and your brother. I hope you do not consider me presumptuous, but will go and look at the paintings and enjoy them. I cannot find an address to your farm to come and buy garlic but I will keep trying until I do. Life is all around us, and we are all together. I missed the First Friday at the Blue Whole this month; we made a trip to Vancouver Island to personally thank the people who risked their lives to find my brother. The weather was terrible that day, the mountain treacherous, and it was amazing that they found him at all in such a remote and densely forested area. The RCMPs and Canadian Search & Rescue volunteers are a dedicated and caring group. And yes, I absolutely love sunflowers. They express so much joy! My garden has become such a place to reconnect with what is real. The garden, the mountains, the rivers, the sea – my grandchildren – are all steady reminders that life is about living and loving – and then every once in awhile, a perfect stranger comes along and reminds me, who are we as human beings, after all, if we do not reach out and help one another? Thank you for your kind words, Lynne – and I look forward to basking in the warmth of a hundred smiling suns (sunflowers, that is)!